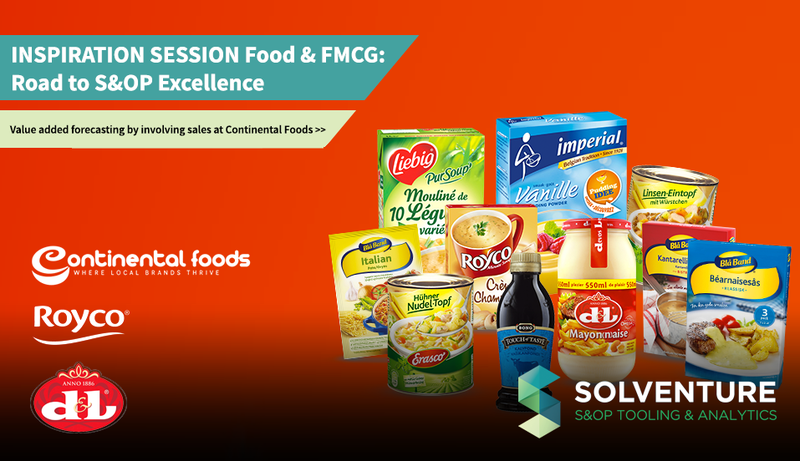 Value added forecasting by involving sales at Continental Foods. At Continental Foods, the demand forecasts by Supply Chain and Sales kept drifting ever-further apart. Something had to be done. Charlotte Corneillie, the company’s demand planning manager at that time, took up the gauntlet. How did she obtain the right input from Sales, how did she keep a tight rein on the process, and how did she manage to save time while also improving the forecasting accuracy? She will be sharing her secrets during the Solventure inspiration session on 28 June, but we can reveal a sneak preview here. Do you sometimes wonder how to improve your collaborative demand forecasting accuracy? Do you find it difficult to involve Sales and/or Finance in the process? Or are you looking for an S&OP solution that facilitates integral collaboration between Supply Chain, Sales and Finance? If so, come to the ‘Road to S&OP Excellence 2018’ inspiration session in Hoevelaken (Netherlands) on 28 June. Charlotte Corneillie will be sharing her experiences at Continental Foods, Michel van Buren will be presenting the effective 6-step approach to S&OP, and Prof. Dr. Bram Desmet will be revealing how you can gain insight into the financial impact of both your commercial strategy and your supply chain strategy. Last but not least, there will be time for interactive discussion of the topics with your peers. Admission is free, but places are limited. Click here to see the full programme and register today. ← Shaping demand or demand shaping? Shaping demand or demand shaping? Why should you use demand sensing and demand shaping techniques?